If you live in the U.S. you can't just jump on a bike on ride in Gurgaon and Delhi if the mood strikes: you have to train for it. This was my third trip in six years to India (I was actually hit by a bicyclist in Mumbai at the conclusion of the first one), I had done an organized tour with Delhi by Cycle, and on this trip two short rides (one bringing the bike back and another up and back along National Highway 8) prepared me for a 'mission based' ride. The mission I wanted was to do with my now three-day-old Atlas ride to the heart of Delhi: India Gate, but it wasn't going to be easy since I wanted to watch what I ate: The day after my bike tour of old Delhi two years ago with Delhi by Cycle I was hit with what can best be described as gastrointestinal vandalism that stayed with me the rest of that trip. Knowing it was probably something I had eaten I was taking great caution and eating meals at the Ambience Mall food court each day thus far. But now I wanted to take a ride so long there'd be no chance of returning to the relatively safe digestive haven of the mall by lunchtime. Foolishly not packing anything other than bottled water, I set off early on Wednesday morning…and quickly came to understand another distinct characteristic of India traffic: right turns are terrifying. This is me getting ready to make a right turn onto Mehrauli Road. It's not the motorcycles massing next to me that I found unsettling (in fact, a pleasant fellow with a turban and a thick mustache on a motorcycle commended me on my bravery of cycling here right around when this photo was taken) but the volume of traffic in this part of the world does things like cram six vehicles on what looks like four lanes. I constantly had to guess where on the road I needed to be in order to turn right without being flattened by vehicles going straight. Not since the infamous 'ugly turn' success of Sandra Bullock's character in 'Speed' has a safe right turn been so satisfying. This stretch was even busier and more bustling than the return trips on Gurgaon road I had made the day before. The concrete median found in the middle of parts of Mehrauli Rd. made certain stretches quite narrow, and that gave every vehicle few options when passing. For some odd reason, I came to enjoy this stretch. Yes, the honking was nearly continuous. Yes, the rising temperature was making the back of my shirt stick to me. Yes, the dust from the road (as well as exhaust fumes and the stench from the occasional garbage pile) was making my nose collapse and fold in on itself, but I liked checking out the different vehicles and watching people move to and fro as they got about their day. And a lot of them were working with pedal-powered vehicles. At one point, every small truck, tuk-tuk and car near me slowed to a crawl so they could pass a slow-moving vehicle. It took me a few minutes to realize what it was - and I was so busy messing with the camera I nearly rear-ended it. It was not the first pedal-powered trike I had seen that had a lot of metal strapped to it, and it wasn't the last. Later, when I managed to find the turn that I knew led to Qutab Minar (because the intersection was so hard to identify I snapped a picture of an orange billboard that read 'YET ANOTHER MILESTONE' to help me remember where to turn when coming back) I saw another. Soon, I came within sight of Qutab Minar - a beautiful attraction I visited with my wife two years previously (she made some beautiful sketches of our 2012 visit that can be seen here). I was now pretty sure where I needed to go to get to India Gate. But as I headed up Aurobindo Road, the traffic got even worse. In Stamford, Connecticut I am at least comforted by the fact that there is usually enough shoulder for me to ride on when the traffic builds up. But in India, there are often no marks to show where the shoulder is, and even if there was the vehicles - which, on a good day, move like a herd of automotive buffalo stampeding - would ignore it. 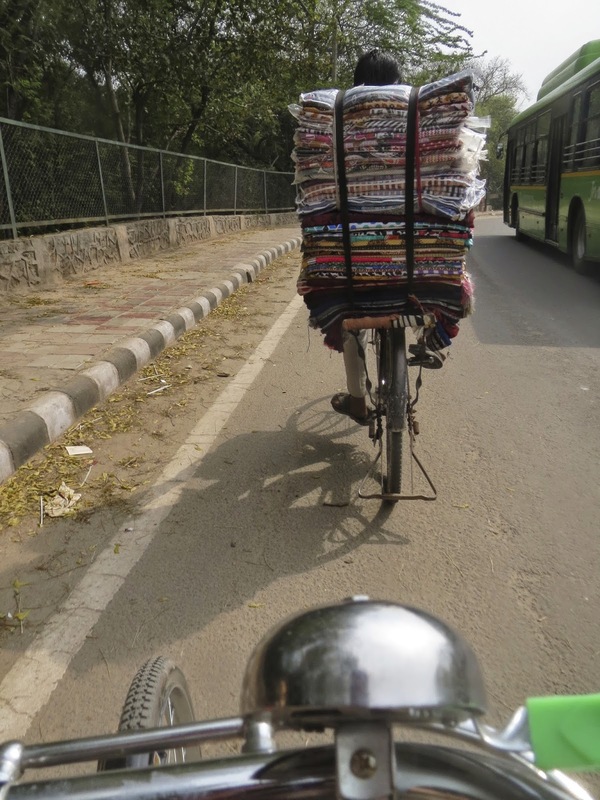 With motorcycles sharing the 'shoulder' with me, I was forced to paddle myself along, Fred Flintstone-style, to continue up toward the center of Delhi. I continued on and thought I recognized a street from my previous visit where I had unsuccessfully tried to find a bike to buy two years before. I didn't have time to dwell on it too much because I had to choose the lane toward India Gate. I pushed on, passing a sign pointing the way to Khan Market. By this time I was getting hungry but didn't see any obvious places to get food, and even if I did, I was in no mood to stop. By now it was past one in the afternoon and I had already pedaled the hulking, single-speed Atlas more than 15 miles. Twice I was forced to use a traffic circle. I don't like traffic circles. Not in any country. But I passed through both of these unscathed. And just when I was beginning to wonder whether I had gotten lost, I came to my payoff. I had arrived at India Gate, but my lack of planning caught up with me in a big way as I had no food on me and saw no obvious restaurants nearby. Lunch on this day consisted of three popsicles purchased from three different vendors in various battered, three-wheeled scooters. I paid 20 Rupees (about $0.33 U.S.) for the first popsicle. I pedaled back and forth along the very pleasant Rajpath and had just finished eating it when I came across another vendor. "How much for the orange-flavored kind?" I asked. I knew the first guy was only a quarter of a mile or so away at this point, so I said: "How about twenty Rupees?" "No," he said, shaking his head. "Twenty-five." I gave in. There are times in India to haggle but this wasn't one of them. But I made a counteroffer anyway: "How about thirty Rupees and you take a picture of me sitting on my bike with my camera?" The man smiled and said, "Okay!" He also took the empty wooden stick and wrapper from my first popsicle and put it in a small trash receptacle on his scooter. After the third popsicle (a mango-flavored one) I did an about-face and headed back to Gurgaon. I had a yoga class to attend and didn't want to miss it. Even though my legs were beginning to feel as though they were carved out of oak at this point, I couldn't believe the numbers of people carrying heavier loads than half a bottle of water in an REI backpack. Closing in on the "YET ANOTHER MILESTONE" billboard, I realized I was still very hungry and bought some Parle-G biscuits from a roadside vendor for five Rupees. These biscuits, which are available at every Indian store in the U.S. I have ever been to, fit perfectly in the Topeak bag I had attached to the Atlas frame that morning. I couldn't resist a picture of the tuk-tuk graveyard - positioned within sight of Qutab Minar - on the other side of the road. Some didn't look much worse than the working ones I had seen and ridden in. I made surprisingly good time pedaling back to the hotel, and managed a grin when I saw the "YET ANOTHER MILESTONE" billboard, which reminded me to turn right. Occasionally, if I was waiting for a red light or something, I'd dip in to my Parle-G biscuit stash and eat a biscuit. 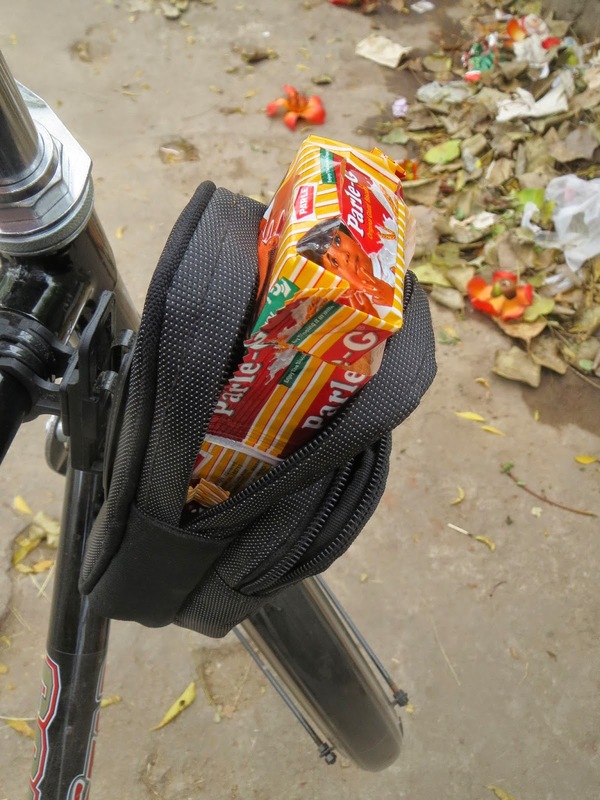 I still got stared at, but I shrugged it off as if to say to them: I'm riding a bike like yours and eating Parle-G biscuits. I'm blending in. So comfortable was I with making it back to the Leela in time for the yoga class, I stopped at another local bike shop en route. As I pointed out already, the bell that came with the bike is loud, commands respect, and I wanted to bring one back home with me. I managed to find one at this shop and happily paid 100 Rupees (about $1.66 U.S.) for it. Still later, I came to another shop that I absolutely adored. You know those independent shops you visit and you have to buy something even though you don't need anything and just want to support them? This was one of those shops. I noticed the green handgrips (visible in the photo, in the plastic bag) and even though I have no use for green handgrips I asked him how much. The price he gave me was identical to what I paid for my first popsicle, so I agreed. But when he showed me, to his dismay, that one of the green handgrips were torn, I bought the pink ones instead. I have even less use for pink handgrips than I have for green ones, but I felt good about handing this guy some money for something. 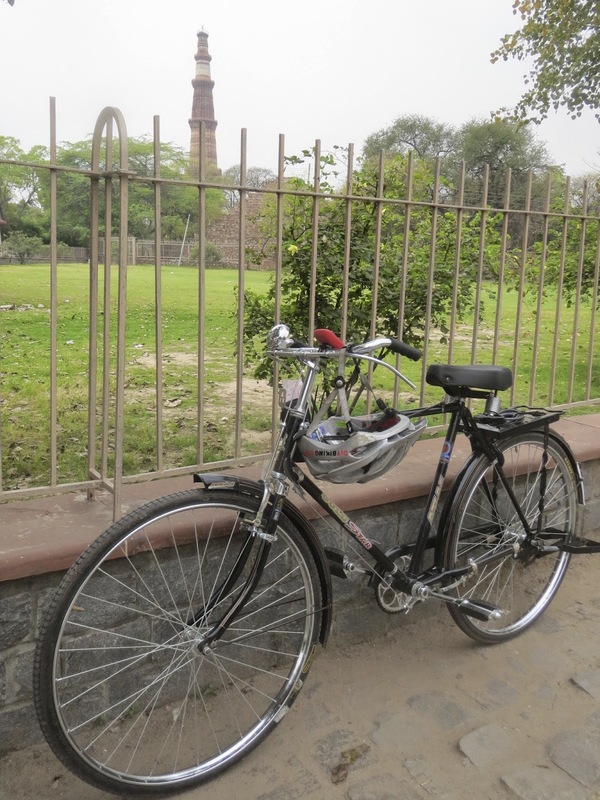 I pressed on through the section of Mehrauli Road I had moved through before, and like before, I somehow enjoyed it. I finished my ride and had gone 36 miles. I parked the bike at the Leela, headed to the mall for a smoothie and an oatmeal cookie, and returned to my room to shower and change before going to yoga. The whole time I was hoping someone would ask me how my day was because I wanted to respond with the word "epic." The following day was broken up into a morning and afternoon ride to avoid a repeat of the popsicle incident. This was notable because I was able to find another route out of Gurgaon: up Anuvrat Road. Like any other road in these parts, this stretch was not without its hazards. This was the third or fourth encounter I had with hamburgers on the hoof during this week in India. I will now use five words I didn't expect to write at the start of this adventure: you get used to it. What made the stretch nice was a good chunk of it followed the yellow Metro line, which is a visible elevated track you can see just to the upper right of the walking steaks. The map I had made it difficult to get lost (as I had already proven), and if anything happened to the bike, I could easily get back. But the bike worked perfectly even though the chain sounded as it was protesting the massive amount of dust and grime I had already exposed it to, and the frame was covered in a fine layer of the stuff as well. Still, I wasn't carrying car tires. Shortly after this photo was taken, I glanced to the other side of the street and had the good fortune to see Cyclofit, which can be found at 842 M.G. Road at Ghitorni, New Delhi. I walked the bike in and browsed the selection and talked to the staff. I learned the shop had been open for about a year and a half and decided that I should get them to clean the chain of my Atlas - which had seen nearly 80 miles at this point. I rolled it into their work area and was immediately impressed: a couple of guys went to work on it like a Formula 1 pit crew, and in minutes I left with a bike that was even cleaner than when I purchased it four days before. Continuing on with a sparkling bike, I came to the "YET ANOTHER MILESTONE" billboard, this time from another direction, and managed a laugh as I turned left. I had done this road a few times at this point but couldn't resist doing it again: after all, it was an entertaining loop back to the hotel and, best of all, I didn't have to make any right turns. 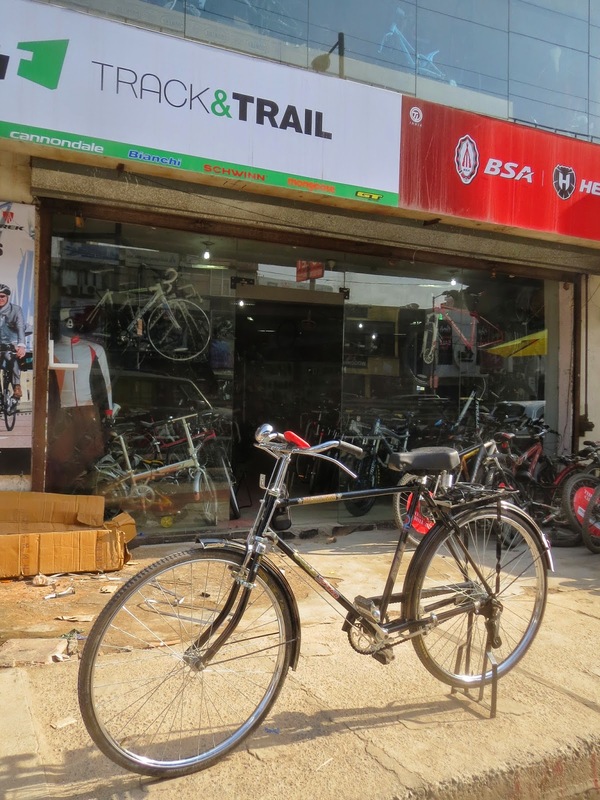 It was during this period my thoughts on cycling in India began to change. I thought less about what I was doing on my bike and more about what everyone else seemed to be doing with theirs. Everyone else was working. Carrying rugs, food, massive quantities of steel, or CNG canisters, people were working - and working very hard. The next morning I'd wrap up an early morning ride and pass 100 miles in five days with legs I could barely stand up in, but over that whole distance I was the only person I saw who appeared to be riding an Atlas for fun. Over the miles I traveled I had come to admire and truly love the bike I had bought, but later, when I went through my photographs of my first India trip I made six years earlier, I noticed that the cell phones everyone was holding have gotten lighter and more powerful. The bikes pretty much stayed the same. I would like very much for the leaders of Atlas and Hero to ride their own bikes for a week, and after that, if they can look me in the eye and tell me that this design - with all of its heft - is the very best product they can sell the hard working people I saw riding them, I will gladly shake their hand. If they finish the ride and say to their colleagues: "You know, if we swap this component for that component we can sell a lighter, more efficient and more powerful bike for the same price, and that means people who buy them will be able to make more trips in less time and make more money for themselves. "…I will shake their hands then, too. Still, with that thought aside, I was sitting on a great bike that I decided needed to stay in India. The more people who ride bicycles in the country, the better. Now I did actually have the option of bringing the bike home with me to Connecticut. Since my wife and I were flying Virgin, which has a sporting goods exemption, I could take the bike on the plane without paying a baggage fee. But this bike needed a more fitting future than occasional use and long stretches of hanging on a hook in my already-crowded basement. I wanted to donate the bike to charity, and I spoke about this with my classmates in the Leela's free yoga class. As it happened, Yvonne, one of my classmates, was connected with one called Sunshine Project Delhi. At the end of our second class, she emailed me a web site and more information about them. Following my 'epic' ride on Wednesday, I told Yvonne I definitely wanted the bike to go there, but due to both of our schedules and the opening hours of Sunshine Project, I couldn't drop the bike off myself. Yvonne also couldn't attend Thursday's class, which meant we had to figure something out soon. Thankfully it didn't take long for me to hatch a plan: I'd ride early Friday morning as a bit of a 'farewell' trip and park the bike in the usual spot and leave Yvonne the keys at the concierge desk. She agreed. So on Friday morning, I took a final ride through the organized mayhem that is India's roads. On the way back, I came to find a slow-moving three-wheeled truck in what passed for a bike lane. The 'Horn Please' sign on the back made the situation look quite ridiculous. But I returned safely with 100 miles under my belt and gave the bike a final wipe down before giving the bell a last, affectionate ring. The keys went in an envelope with Yvonne's name on it, and inside I also left a note thanking her for agreeing to bring the bike to the Sunshine Project. It made me smile, and I decided that the next time I'd visit India I'd do this all over again. Thanks for reading and thanks for riding. Such a great adventure! I'm glad you had fun on your roadster bike in India. And you're right, these bikes should be better, but the companies would have to take a hit to their sales if they made these any pricier. Folks around here have just gotten used to spending about $60 for a bike and the bikes made today are actually of worse quality than the bikes of 20 years ago which sold for about the same (adjusted for inflation, of course). Sadly, this means that most of these riders who suffer on their heavy bicycles are just ready to jump on a motorized two wheeler as soon as they can afford it. Hardly anyone realizes that there is a better option. 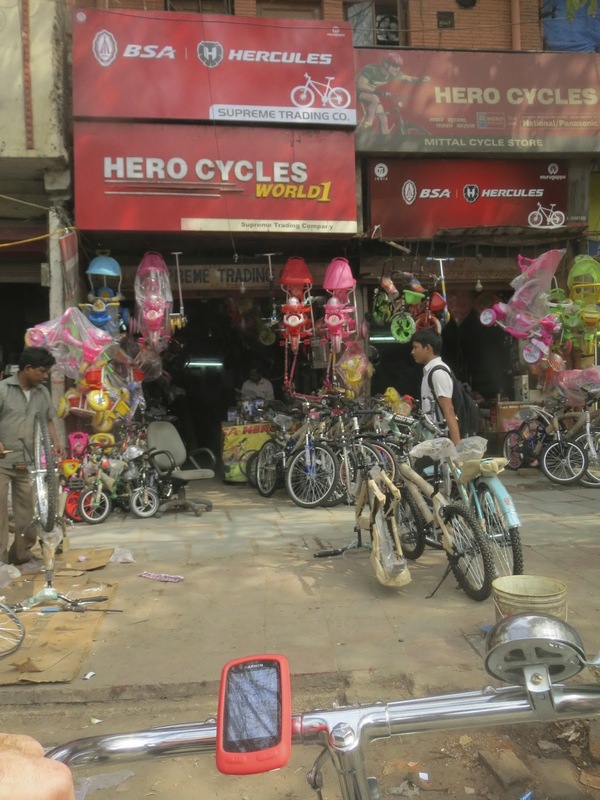 Wow , it was great reading the 'epic' experiences you had riding in Delhi. Reading about you being surprised about the chaotic conditions of the Indian traffic that we have gotten used to and almost taken for as a part of our daily lives was hilarious !